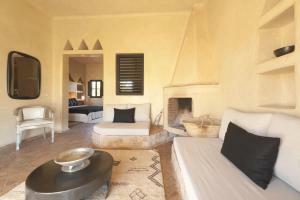 In a calm setting, Jnane Allia is located 18km from Marrakech. 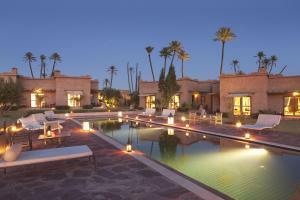 This resort is placed on a 2 hectare garden and offers a swimming pool, hammam and massage room. 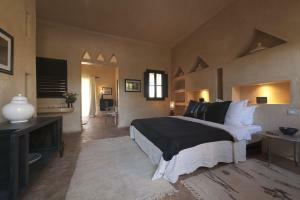 Each suite, designed in a contemporary style, features a lounge with a fireplace and a private pergola. All suites are facing the swimming pool, and facing south to allow a view of the magnificent sunsets. This resort has a shared space with a fireplace and a large tent where guests can relax. 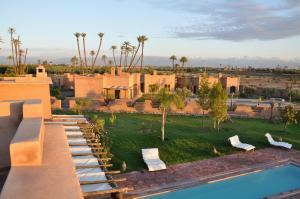 The resort offers excursions such as hot air balloons and horse riding. Jnane Allia provides a free shuttle to and from the airport, a car rental service, as well as free bicycles. Breakfast also is included. يقع Jnane Allia في أجواء هادئة، وعلى بُعد 18 كم مراكش. يقع هذا المنتجع على حديقة بمساحة هكتارين ويحتوي على حمام تقليدي وحوض سباحة وغرفة للتدليك.تتميز جميع الأجنحة بتصميمٍ بأسلوب معاصر، وتضم صالة مع موقد وعريشة خاصة. وتطل جميع الأجنحة على حوض السباحة وتطل على الجنوب للسماح بالنظر إلى غروب الشمس الرائع.يحتوي هذا المنتجع على مساحة مشتركة مع موقد وخيمة كبيرة تمكن للضيوف الاسترخاء. يقدم المنتجع الرحلات مثل بالونات الهواء الساخن وركوب الخيل.يوفر Jnane Alli خدمة نقل مكوكية من وإلى المطار عند الطلب بالإضافة إلى خدمة استئجار السيارات والدراجات مجانًا. يشتمل السعر على وجبة الإفطار.